BRACEVILLE, Ill. - Radioactive tritium has leaked from three-quarters of U.S. commercial nuclear power sites, often into groundwater from corroded, buried piping, an Associated Press investigation shows. Tritium, which is a radioactive form of hydrogen, has leaked from at least 48 of 65 sites, according to U.S. Nuclear Regulatory Commission records reviewed as part of the AP's yearlong examination of safety issues at aging nuclear power plants. Leaks from at least 37 of those facilities contained concentrations exceeding the federal drinking water standard -- sometimes at hundreds of times the limit. At three sites -- two in Illinois and one in Minnesota -- leaks have contaminated drinking wells of nearby homes, the records show, but not at levels violating the drinking water standard. At a fourth site, in New Jersey, tritium has leaked into an aquifer and a discharge canal feeding picturesque Barnegat Bay off the Atlantic Ocean. Previously, the AP reported that regulators and industry have weakened safety standards for decades to keep the nation's commercial nuclear reactors operating within the rules. While NRC officials and plant operators argue that safety margins can be eased without peril, critics say these accommodations are inching the reactors closer to an accident. The tritium leaks also have spurred doubts among independent engineers about the reliability of emergency safety systems at the 104 nuclear reactors situated on the 65 sites. That's partly because some of the leaky underground pipes carry water meant to cool a reactor in an emergency shutdown and to prevent a meltdown. More than a mile of piping, much of it encased in concrete, can lie beneath a reactor. Like rust under a car, corrosion has propagated for decades along the hard-to-reach, wet underbellies of the reactors -- generally built in a burst of construction during the 1960s and 1970s. As part of an investigation of aging problems at the country's nuclear reactors, the AP uncovered evidence that despite government and industry programs to bring the causes of such leaks under control, breaches have become more frequent and widespread. At the LaSalle site west of Chicago, tritium-laden water was accidentally released from a storage tank in July 2010 at a concentration of 715,000 picocuries per liter -- 36 times the EPA standard. The year before, 123,000 picocuries per liter were detected in a well near the turbine building at Peach Bottom west of Philadelphia -- six times the drinking water standard. And in 2008, 7.5 million picocuries per liter leaked from underground piping at Quad Cities in western Illinois -- 375 times the EPA limit. A 2008 NRC staff memo reported industry data showing 83 failed cables between 21 and 30 years of service -- but only 40 within their first 10 years of service. Underground cabling set in concrete can be extraordinarily difficult to replace. The leaks sometimes go undiscovered for years, the AP found. Many of the pipes or tanks have been patched, and contaminated soil and water have been removed in some places. But leaks are often discovered later from other nearby piping, tanks or vaults. Mistakes and defective material have contributed to some leaks. However, corrosion -- from decades of use and deterioration -- is the main cause. And, safety engineers say, the rash of leaks suggest nuclear operators are hard put to maintain the decades-old systems. Several notable leaks above the EPA drinking-water limit for tritium happened five or more years ago, and from underground piping: 397,000 picocuries per liter at Tennessee's Watts Bar unit in 2005 -- 20 times the EPA standard; four million at the two-reactor Hatch plant in Georgia in 2003 -- 200 times the limit; 750,000 at Seabrook in New Hampshire in 1999 -- nearly 38 times the standard; and 4.2 million at the three-unit Palo Verde facility in Arizona, in 1993 -- 210 times the drinking-water limit. Many safety experts worry about what the leaks suggest about the condition of miles of piping beneath the reactors. "Any leak is a problem because you have the leak itself -- but it also says something about the piping," said Mario V. Bonaca, a former member of the NRC's Advisory Committee on Reactor Safeguards. "Evidently something has to be done." One of the highest known tritium readings was discovered in 2002 at the Salem nuclear plant in Lower Alloways Creek Township, N.J. Tritium leaks from the spent fuel pool contaminated groundwater under the facility -- located on an island in Delaware Bay -- at a concentration of 15 million picocuries per liter. That's 750 times the EPA drinking water limit. According to NRC records, the tritium readings last year still exceeded EPA drinking water standards. The operator had not visually inspected the piping -- the surest way to find corrosion- since the reactor went on line in 1977, according to the NRC. PSEG Nuclear was found to be in violation of NRC rules because it hadn't even tested the piping since 1988. Last year, the Vermont Senate was so troubled by tritium leaks as high as 2.5 million picocuries per liter at the Vermont Yankee reactor in southern Vermont (125 times the EPA drinking-water standard) that it voted to block relicensing -- a power that the Legislature holds in that state. Since then, workers have found leaking tritium three more times at concentrations up to 10.8 million picocuries per liter -- 540 times the EPA's drinking water limit -- according to the New Jersey Department of Environmental Protection. None has been directly measured in drinking water, but it has been found in an aquifer and in a canal discharging into nearby Barnegat Bay, a popular spot for swimming, boating and fishing. To Exelon -- the country's biggest nuclear operator, with 17 units -- piping problems are just a fact of life. At a meeting with regulators in 2009, representatives of Exelon acknowledged that "100 percent verification of piping integrity is not practical," according to a copy of its presentation. Exelon has had some major leaks. At the company's two-reactor Dresden site west of Chicago, tritium has leaked into the ground at up to 9 million picocuries per liter -- 450 times the federal limit for drinking water. At least four separate problems have been discovered at the 40-year-old site since 2004, when its two reactors were awarded licenses for 20 more years of operation. A leaking section of piping was fixed that year, but another leak sprang nearby within two years, a government inspection report says. The Dresden leaks developed in systems that help cool the reactor core in an emergency. Leaks also have contaminated offsite drinking water wells, but below the EPA drinking water limit. Braidwood has leaked more than six million gallons of tritium-laden water in repeated leaks dating back to the 1990s -- but not publicly reported until 2005. The leaks were traced to pipes that carried limited, monitored discharges of tritium into the river. 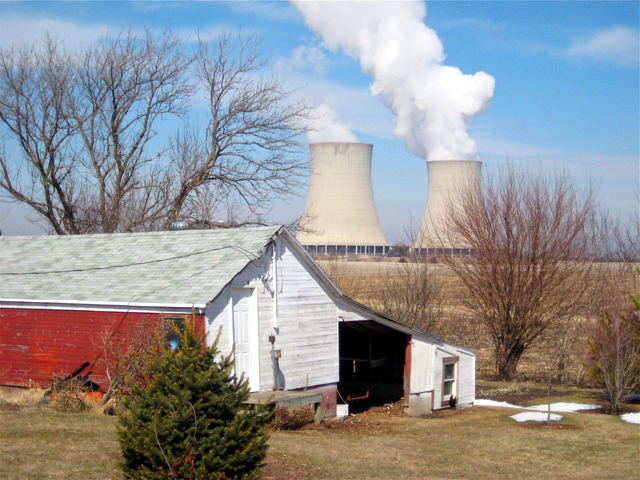 Retirees Bob and Nancy Scamen live in a two-story house within a mile of the reactors on 18 bucolic acres they bought in 1988, when Braidwood opened. He had worked there, and in other nuclear plants, as a pipefitter and welder -- even sometimes fixing corroded piping. For the longest time, he felt the plants were well-managed and safe. Meantime, the reactors keep getting older -- 66 have been approved for 20-year extensions to their original 40-year licenses, with 16 more extensions pending. And, as the AP has been reporting in its ongoing series, Aging Nukes, regulators and industry have worked in concert to loosen safety standards to keep the plants operating.